Until recently, I thought blisters were a necessary and unavoidable evil. 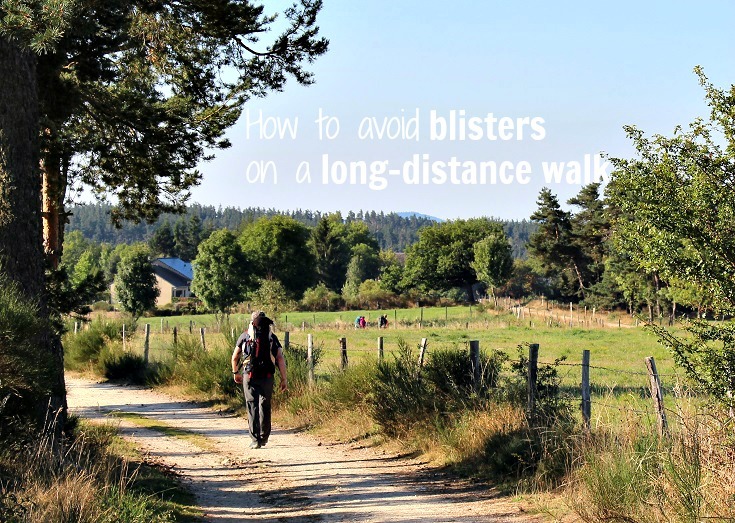 As someone who often walks 15 – 20 kilometres (10 – 12 miles) each day on a regular holiday, I’ve always suffered from tiny water blisters on the balls of my feet. Each night, I’d slice them open, release the liquid and cover them with a large band-aid before starting over the next morning. The little bit of padding in a band-aid (maybe two) was all I needed to feel OK and do it again another day. I assumed this was the price to be paid for choosing style over practicality in walking shoes! Despite all four of us wearing the exact same très confortable et sensible Merrill walking shoes, my friends survived relatively unscathed! And ironically (but for reasons easily explained by my podiatrist), my feet hurt the LEAST when I was walking and the most when we stopped for lunch! As it turns out, blisters are NOT a necessary and unavoidable evil. The improvement in my feet on the next walk was enormous! I had rubbed the methylated spirits on my feet with a cotton pad and so I developed some small blisters in the places I missed—between my toes, under my toes…and I dislodged a toenail because I hadn’t allowed for the compression sock providing less padding inside the shoe. (3) Wearing socks with individual toes and toeless compression stockings while walking (although I found the toeless stockings trapped fluid in my feet so I only wore them once). I am delighted to say I had NO problems on my last walk (in September 2015)!! Despite all my preparations (which last year resulted in a blister-free walk), my feet are somewhat battered and I do have a few blisters. What happened? Day one of the walk from le-Puy-en-Velay to le-Monastier-sur-Gazeille was to be a nineteen-kilometre (thirteen-mile) walk. But after accidently veering off the GR 70 and onto another red-and-white blazed GR path (most likely the GR 3F), it became a much longer day of more than thirty kilometres (nineteen miles). Somewhere past the twenty-five kilometre mark, I felt my feet tingling as the circulation started to struggle; a few kilometres more and they were becoming noticeably tender as blisters formed on the balls of my feet. It’s a sad fact that I’m no longer thirty years old and my feet have a quota of work they are willing to do in a day. For me, it seems this is around 25 kilometres – any more than this and I’ll suffer the consequences. Thankfully, my feet toughened up somewhat and, although tender, saw me through the remainder of the walk without too much trouble. And after a day of rest as we travelled back to Paris on the train, they were as good as new! I’m not suggesting for a moment that my blister solutions will be the answers to your problems. Blisters caused by rubbing are best avoided with well fitted, comfortable, well worn-in walking boots. But if you do suffer from blisters while walking, please know that there may be a solution. Find a good podiatrist who will assess your walking technique at least six weeks beforehand, giving you plenty of time to implement and prepare. You’ll find many more practical tips for long-distance walking here. In Europe Compeed is the GO TO remedy for blisters. Preferably it should be applied at the “hotspot” stage and left on until it drops off. Yes, even in the shower and yes, it does get yucky but taking it off too soon can easily damage the regenerating skin. Received knowledge these days appears to be that you should never, ever puncture and drain blisters as this is a motorway for infection. Infection control is a major issue in dealing with blisters. Agree with everyone say above and also remember laughing hysterically when you showed me your socks with toes (foot gloves? ), but I’ll take your word vouching for them. I’m not sure I can resist puncturing my blisters but what you say about infection certainly makes sense. I find they are a lot less painful once drained. I suppose the trick is to not get them in the first place! I did find one small fault with the socks with toes – last time I dislodged another toe nail and didn’t want to risk tearing it off while wriggling my toe in and out of those socks. But, otherwise, perfect! I walked Le Puy to Conques without too many problems. I had one blister that I have treated with Compeed, and that worked like a charm! I bought Arnica Gel from a pharmacist (France is great for all the natural / homeopathic products) and covered my feet and ankles with it every night after my shower. It was hot every day, but my boots worked well with just a thin merino sock. Stretching every night after the walk is extremely helpful. The first day was the longest due to getting lost, and I walked 30km. Next year I am getting a new pair of boots, same brand but more profile on the sole. The ones I have are great, but somewhat too flexible on those uphill/downhill, rocky, narrow paths. I had one day of deluge, and I have learned that you need a pair of gaiters to cover the boots and prevent the water getting in through the tops. Alternatively, tie on rubbish bags over the tops of the boots. At the end of the day, you need to stuff your boots with newspaper, to dry (old trick from my hiking in the snow days). I am in the over 60 age group, and not extremely fit. Those are great tips! I agree, stretching is so important – every night, and every morning, after lunch 🙂 it all helps! I am definitely taking some Compeed patches with me next time! I often get blisters and want to prevent them. Thanks for the advice about how your walking technique could be flawed and causing blisters. Another thing to consider is that you might not be wearing the right shoe support. I’ll have to see about going to a podiatrist to help stop my blisters. That’s true Sarah and a good podiatrist will also check your shoe support. It’s a good idea to take your regular hiking shoes with you when you go to the podiatrist.